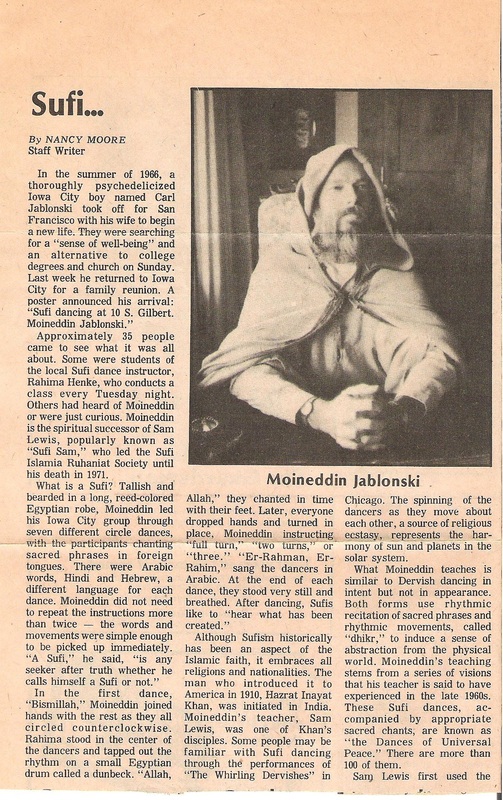 This is the cover letter for copies of letters of June 13, 1978 to Fatima and June 15, 1978 to Fatima, the kids and 9 other folks who lived together and the article about Moineddin “Sufi dance of enlightenment for local boy” from The Daily Iowan, which appeared June 20, 1978 [see thumbnail]. Moineddin travelled, and received dialysis in hospitals far from home. That he carried on with this disability should be mentioned here, It only receives mention in his letters when the dialytical method differed from his usual, and he suffered greatly. The name of our new Khankah is Noor Mahal which means :Light of the Court”—a perfect appellation for this residence. The name Noor also bears reference to the sainted Noor-un-nise Inayat Khan whose influence is also felt. The name just popped out of Fatima’s mouth at a recent family meeting; until that moment many names had been floating around without any real foundation, but Noor Mahal had the sound and feel of reality.